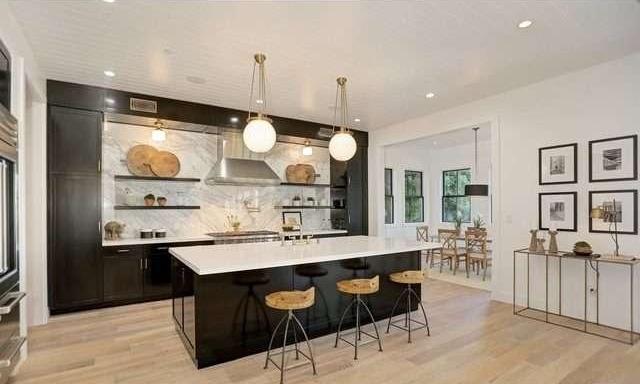 New to the market comes a modern farm house that redefines design and construction in Sherman Oaks. This sprawling gated Sutton residence is simply an exceptional interpretation between clean lines and timeless materials. Sophisticated luxury features include a Crestron home automation system, Dolby5.1 sound, Waterworks plumbing supplies, Calcutta marble slabs, Wolf dual fuel range, Sub Zero PRO refrigeration, light oak farm floors, La Cantina doors, custom barn doors with wired embedded glass and steel roof. Amenities include a private movie theater, 40 foot long black bottom pool, spa and pool house. 215 feet of lot depth allows for the ultimate in outdoor entertaining and relaxing. This inspiring architectural dwelling is conveniently located a few blocks from Ventura Boulevard shopping and dining. Click HERE for more information.